Midline scalp lesions may be of diverse nature. In most instances, clinical examination, MRI, and especially MRV contribute to determine the nature of the subcutaneous scalp mass (16, 28). If after diagnostic work-up, doubt still exists about the nature of the mass, the author recommends performing an excisional biopsy. Detailed history: A careful history, including familial and gestational data, should be obtained. Teratogens: Special attention is paid to asking about teratogen intake. Consanguinity and familial traits: A genealogical chart must be obtained for children with the antecedents of parental consanguinity, familial presentation, or associated malformations. Nodular, cystic or atrophic appearance: The lesions may be nodular, cystic, or flat with atrophic skin. The skin is usually of normal appearance, but it may be translucent, atrophic, or show a “collar” of abnormal long hairs. Typically, the lesion does not swell up after effort (Valsalva) or when the child is in the recumbent position. The lesions may be very painful. Normal neurological examination: The neurological examination is usually normal except in cases with associated “occult” intracranial anomalies (16). 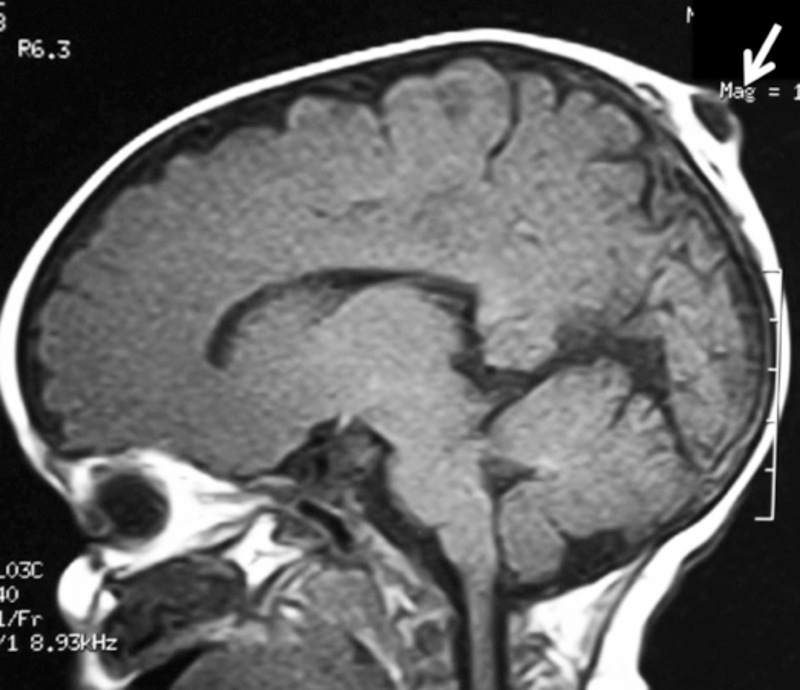 Hypotonus or hypertonus: When occult brain anomalies do occur, the children may present with hypo- or hypertonus related to the underlying anomaly (migration disorders, etc.). Macrocephaly and hydrocephalus: Macrocephaly is almost a constant finding in cases associated with hydrocephalus. Evaluation of other organ systems: A general evaluation searching for systemic disorders is required in cases of syndromic atretic encephaloceles (16). Almost any organ can be involved, especially the heart, eyes, and muscle. Karyotype: Karyotyping should be considered for all patients, followed by a genetics consultation in complex or syndromic cases. Skull defect with sclerotic margins: Plain skull radiographs usually show an elongated or round cranial defect, often with sclerotic margins. 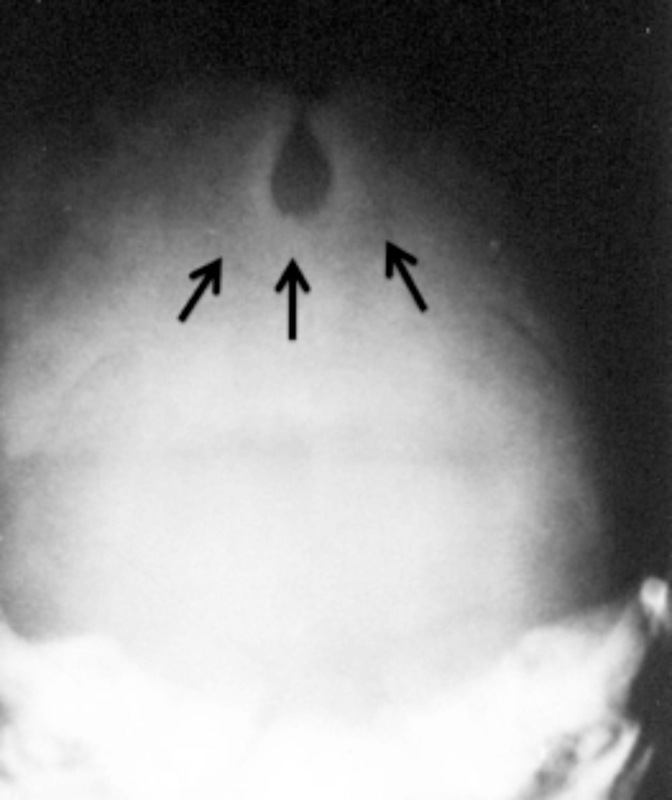 Plain skull x-ray of encephalocele: Radiograph shows the associated skull defect (arrows). Examination of subcutaneous lesion: Ultrasonography may help to ascertain the nature of the subscalp mass and its corresponding skull defect. 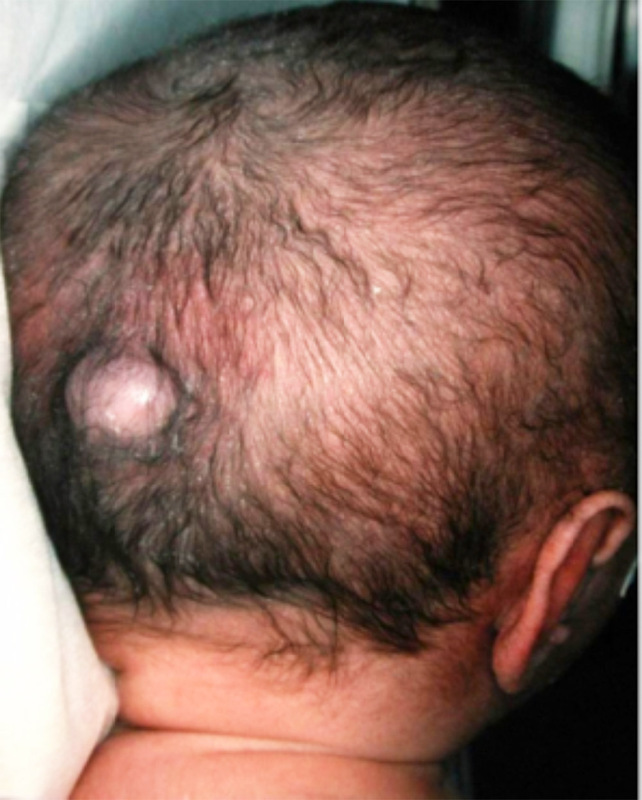 Scalp mass and skull defect: The soft tissue mass below the scalp can be seen. The skull defect will also be seen. Post-contrast CT typically shows enhancement of the subcutaneous lesion due to the vascular component of the lesions and to persistency of fetal vessels (16). 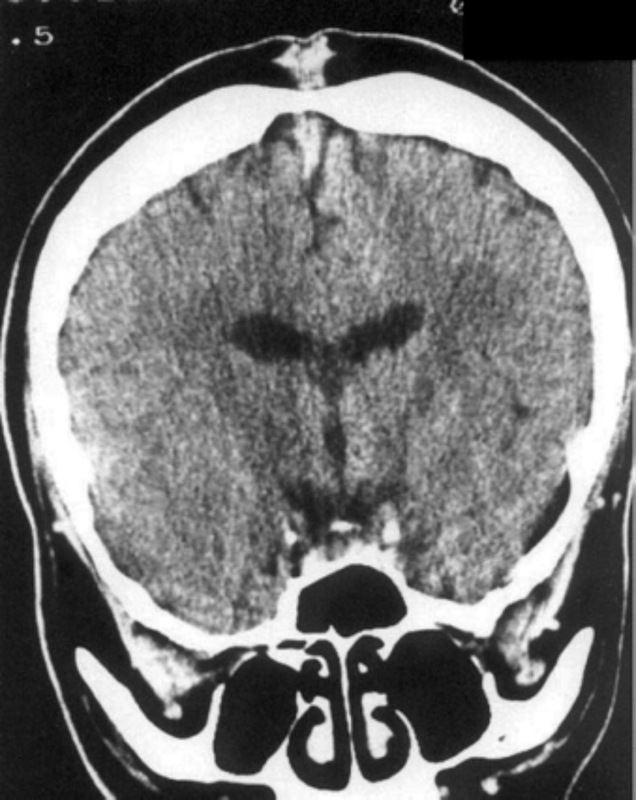 Intracranial anomalies: A “cigar-shaped” interhemispheric arachnoid cyst that goes from the dorsal mesencephalic cisterns to the lesion can be seen as a component of a parietal atretic and encephalocele (16, 28). CT may also depict associated cerebral anomalies such as hydrocephalus, posterior fossa cysts, and others (16, 21, 28). 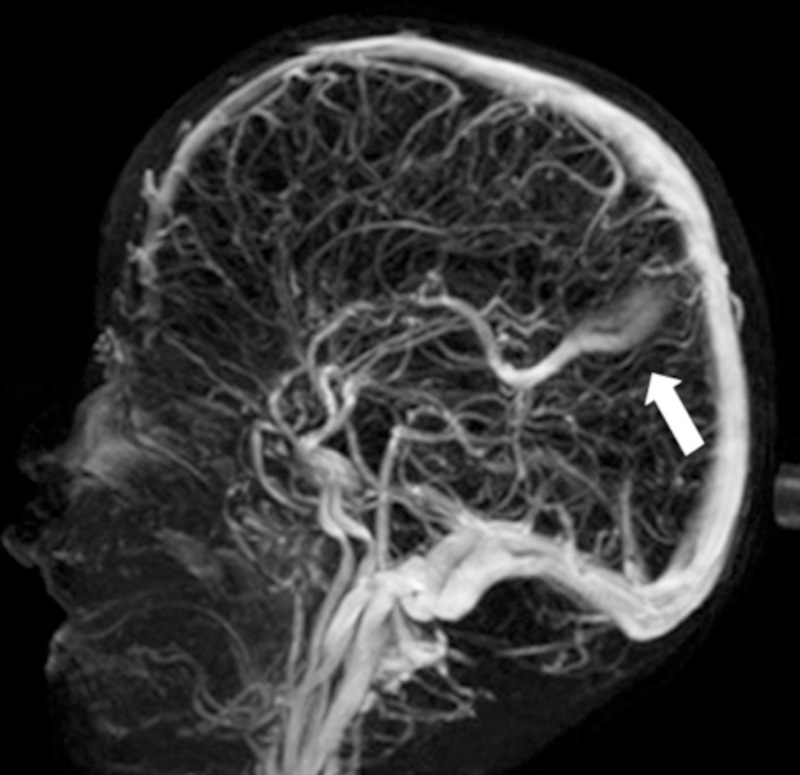 Coronal CT scan of an atretic encephalocele: A midline enhancing lesion is present in the subcutaneous tissue of the scalp directly overlying the sagittal sinus. 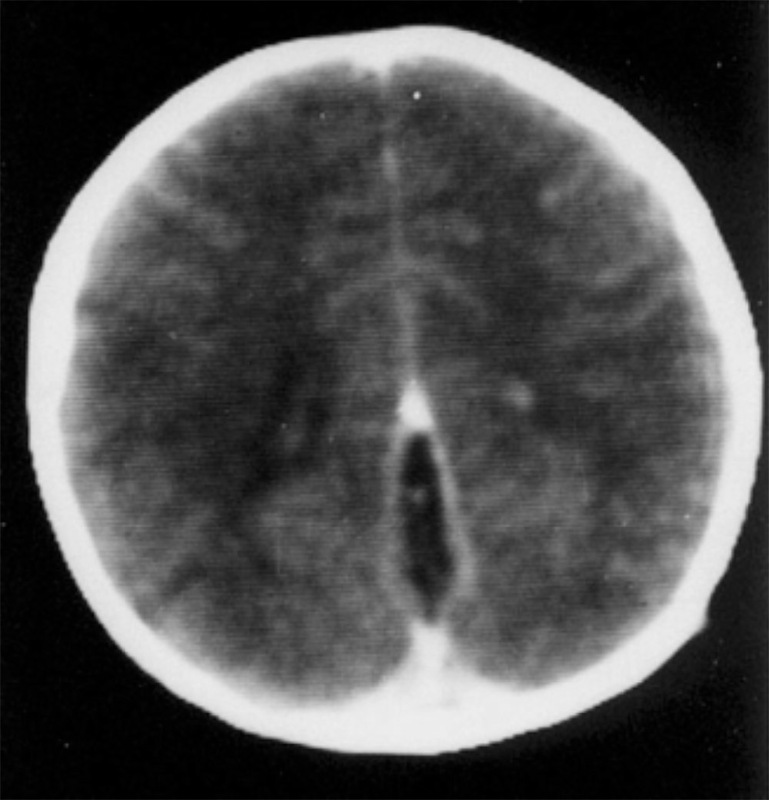 Axial CT scan of an atretic encephalocele: A cigar-shaped, interhemispheric area of lucency is present consistent with an arachnoidal cyst. 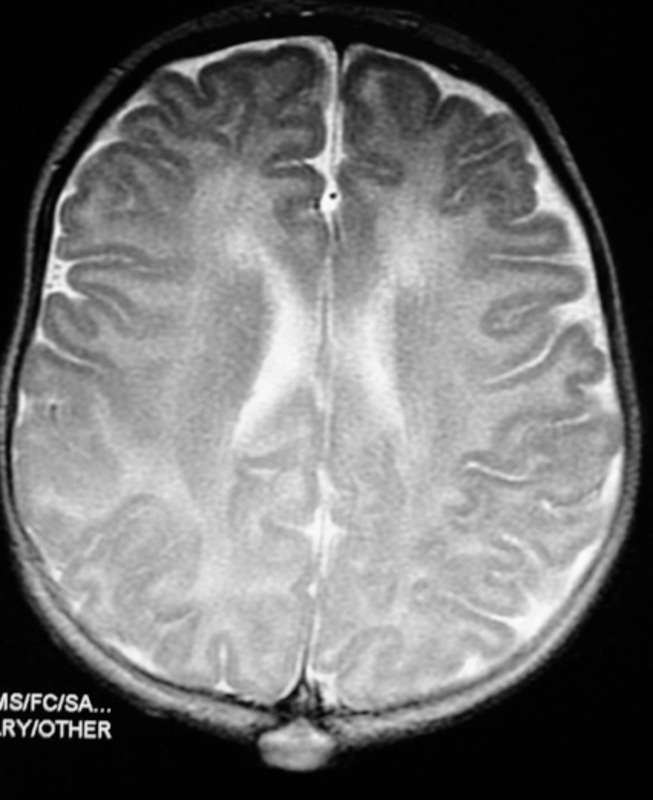 MRI is the preferred imaging method for atretic encephaloceles. Shows lesions anatomy and relationships to sinus: MRI defines the characteristics of the lesion and delineates the relationship of the lesions with the sagittal sinus. Depicts associated anomalies of CNS: MRI discloses the presence of hydrocephalus or ventriculomegaly, corpus callosum dysgeneses, details of the cerebellum and associated posterior fossa cysts, and, in syndromic cases, anomalies of neuronal migration disorders (16, 21, 28). 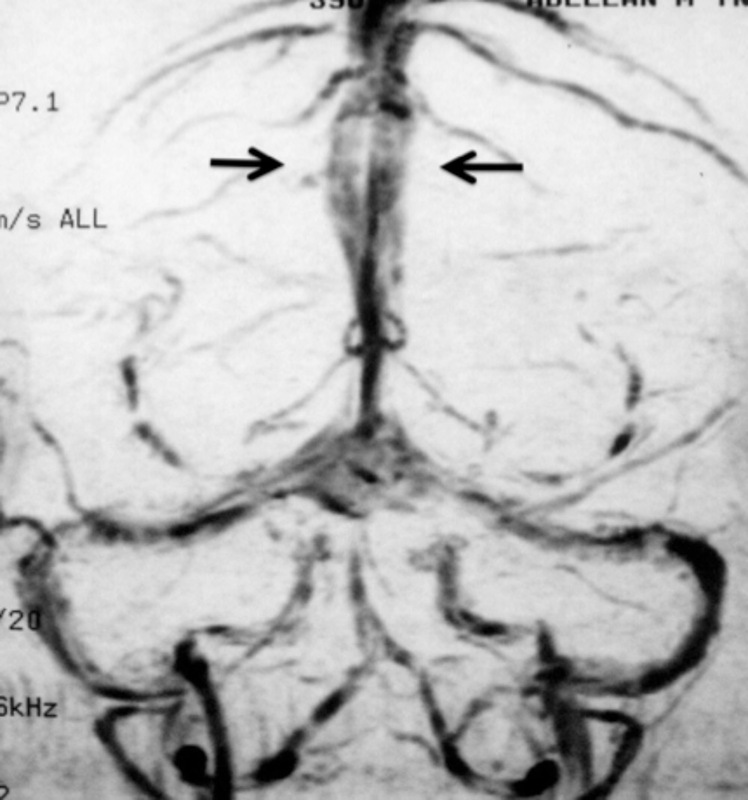 MRV to assess sinus anatomy: MRV can show duplication of the sagittal sinus around the lesion’s stalk, absent or abnormal straight sinus, and presence of a venous sinus of embryonic type, the falcine sinus (4, 7, 24, 25, 28). EEG: EEG can be performed in children with atretic encephalocele with associated brain pathologies to locate epileptogenic foci. Evoked potentials: Usually there is no need for neurophysiological testing. However, special cases can be investigated, pre- or postoperatively, with brainstem, somatosensory, or visual evoked potentials. Optional: Neuropsychological testing may be used to assess neuropsychological development of the affected children. Clinical examination with imaging: Clinical examination, MRI, and MRV are essential for diagnosis and for planning surgery. 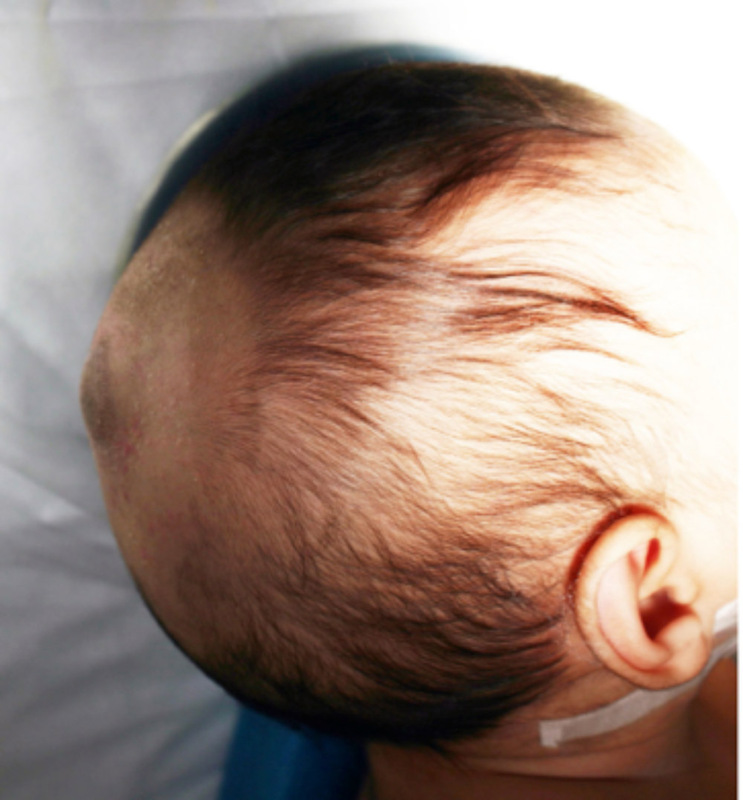 The differential diagnosis of atretic encephalocele is established against other congenital midline scalp lesions and includes dermal cysts and sinuses, sinus pericranii, and other vascular or neoplastic lesions of the skull and scalp (16, 21, 22, 28).